The game still needs a lot of work. 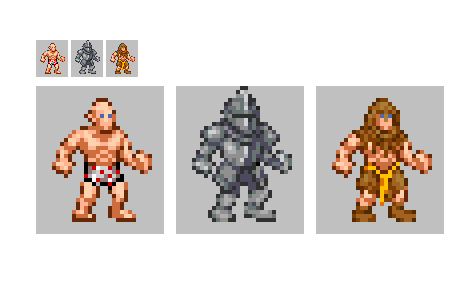 The sprites are very simple however. They only have 2 frames and don't walk, instead they hop like if you were moving boardgame pieces. The shading is only 2 shades per color, and the base size is 32x32 for mostly everything. The game is generic right now because I lack the sprites to make it how I want it to be. Once I have some of the unique sprites, I can code in a lot more things and give the game it's personality. It's going to be a dungeon crawler. You have a variety of useable items, weapons and armor upgrades, powerups and different monsters you can use. The gameplay is a mix of Nethack, Gauntlet, and Ghouls n Ghosts. 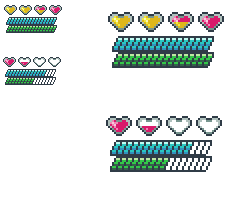 The the other things I need are just 32x32 single sprites. I can probably help out. I'll try to work on something basic and I can send it to you in a DM. If any of these can help, feel free to use them. I can work with edits but you can only do so much with what I have. I tried to make knight armor but I can't get it to too look right or match. I am happy with my tattered armor though, just supposed to be a bunch of rags. I did some editing on your character art to more closely match my own pixel art sensibilities. I did the knight armor based loosely on the Dark Souls Elite Knight armor set. If you like them, feel free to use them; if you want more, hit me up and I'll see what I can do. I'd like to expand on darkmfalz's idea. 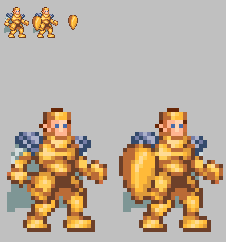 I added a sort of gold set of armor. Also, I love what you did the naked guy's body and how much better it looks, so I will be using that style for certain. It's funny because the only other armor I had made was golden armor (and it was bad) so this just made my jaw drop. It's really damn good. I like it a lot, if you are willing to do more, I can and will pay you if you're interested. I don't need a whole lot more. I just have it where you start off with tattered rags, get studded leather armor, some iron breastplate/mix of leather armor, plate, golden armor, etc, etc. So there doesn't need to be many more and you guys basically just made the sets for me lol. Some more additional content. No payment necessary. And perhaps some fire elemental sprites. 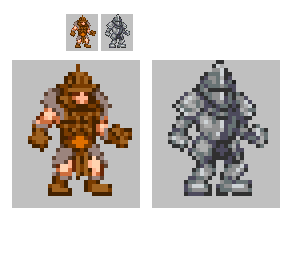 On top of that, I retouched the plate armor a lil bit and tried my hand at some leather armor. It's all good. This helps me from being bored. Also. Perhaps you can use this for a boss? Wooodlings! I am basing the game on gauntlet dark legacy which had tree creatures so seeing these is like YEAH! I remember you things! They are beautiful, I'm going to make them for the first level. Where when you go to the woods.. the woods, also comes to you. The ettin is so top quality I can only gock at it. Yes, I had nothing, now I have real stuff! I can make this weird mutant gauntlet game after all. So, what are your thoughts on some recruitable monsters having a class system? Yeah, I could add class to the monsters. Pojo the firebreathing chiken would love that. He's classy. What's your idea for a class system? Most of the stats are gained from the gear you find as I have it so far, not really about grinding or leveling up but still worth fighting the same monster again for certain things. Rare drops, and can always bribe the monster. So there is always a reason to fight them aside from XP. Oh... and.. are you any good with like, hit effects? Like when you hit something, you see a little blip or blop or particle effect? I am needing one that I can just recolor to represent magical elelments. So when you get hit with Fire, it's orange, when hit with Water, it's blue. Something like this. Well, with that being said. I mean to assign them a class when they level up. Also, I can look into hit effects. I'll probably do 4 frames to add a little detail, but still simple enough for your game setup. Is that alright? Let me know if these work for you to start. A quick example of a class choice idea. I have it now where instead of class, its individual monsters. So say there's a regular dino, and you wanted a fire dino. You'd have to find a fire dino. That way there are three monsters total, dino, fire dino, ice dino. So in the game now, you have a goblin, a goblin warrior, and a goblin shaman. Using the class system, there would be less monsters to bribe, but another use for items. And it does cut down on having too many monsters to bribe. So you bribe a goblin and you can change it into a shaman or a warrior. What would you suggest be the way you change the class? A specific objective and an item, or what do you suggest? Because this seems like a better idea than what I have with multiple monsters, so I am going to change it to be like this. Thanks for all the help by the way. Working on this game is my escape from reality and it brings me a lot of joy, so I appreciate you helping me with it as much as you have. Current use for items: they can be sold for gold and every bribeable monster likes 1 special item that when used in battle, increases the bribe chance by 10% per item used. So you want a giant rat, you find cheese somewhere else in the game. Use the cheese in battle, your chance to bribe a giant rat is now +10% for that battle. So there's already a use for items, as actual use items or for bribing. If it wouldn't be too much, they could be used for class changes, too. Unless you have an idea for that that doesn't use items. I don't have a level system, since I wanted to try without it and make stats mostly about what gear you've obtained and the monster you've bribed. Some monsters will always be stronger/better than another, but there are items and gear that increase the stats of your monster, some permanently. Like a strength potion that gives your monster +1 to strength permanently, or a helmet that when worn grants whatever monster you have +1 strength temporarily. That way if you really don't want to use a monster other than a chicken, you can eventually make it strong enough to be on par with a dragon or something and not be forced to get stronger monsters. also I forgot I had an account here already, lol. So thats why my name changed. Forgot which email I used but hey, I remember it now. Another question that gives me, if a slime turns into a red slime, when you fight red slimes, should they be able to be bribed or no? Since you have the class system, it would make it a bit pointless to be able to change a slime's class and still bribe that monster if you see it. Hmmm.. Or maybe the red slime is harder to bribe. So, you have a slime. You want a red slime. You can class change it, or bribe a red slime. Or you can't bribe monsters that are class changes, you can only class change them and bribe the base monsters. Maybe to get around this, some monsters are rare and you won't ever encounter them, so they only way to get them is to class change a monster. Like you can find red slimes and bribe them, but you can't find a rainbow slime, you have to class change into. What do you think about that? A class changed monster has better stats than a monster bribed from battle. That's something I could do, too. Or they can have special abilities you can only get from class changing with an item. You could create a HUB in certain towns that you bring the monster and items to. There could be a list that generates based on what monster you have and if you have the corresponding item to change it's class, the list would be available via dialogue or something similar. I would also say that yes, you could still bribe more advanced monsters. I would instead add a 3rd skill or a more advanced skill(or just an addition ability depending how you set up your battle commands) for class changed monsters vs wild bought monsters. I think it'd also be worth looking in-depth at the systems in both Pokemon and Shin Megami Tensei for some inspiration. In Pokemon, it is similar to the stats you've layed out for wild Goblin warrior vs promoted Goblin warrior: wild pokemon always have shittier stats, so you're always better off evolving your pokemon, and if you really wanna optimize your stats, you need to breed pokemon and train them from low level (has to do with IVs, EVs, etc -- I dunno how familiar you are with high-level Pokemon, but I used to dabble). I'm not sure that evolution like for most Pokemon would work for you, but I'd be interested in seeing like an expanded version of those unique evolutions of Pokemon, e.g. evolution stones, levelling up at night vs at day, levelling with happiness vs unhappiness, levelling up in certain environments. In Shin Megami Tensei, the system is demon fusion. This one is particularly interesting, b/c you can produce the same monsters from multiple fusions, but dependent on the monsters involved in the fusions, the resultant skills are different. If I were re-making this system, I might go for something like a primary monster / secondary monster fusion, where the primary monster determines form and primary skills and the secondary monster determines differences in stats and secondary skills. To kinda give an example of what I got in my head -- maybe you wanna make a red slime (I'm assuming the red slime has a fire nature), so you can fuse a slime with the fire dino, or you can fuse a slime with a djinn (made of fire) -- the first one would produce, say, a red slime that can breathe fire, but the second would produce a slime with higher fire resistance and causes fire damage on physical contact. Something like that, y'know? So far, I have it where you use an item to class change a monster, like those evolution stones in Pokemon (I looked it up and it seems to be similiar to what I have now) You just need to visit the shrine and have the item, and pay a little bit of gold. I will adjust this to have more or make it something else if needed, it's just to get a basic system down. I'll post a video. If your monster can change class, the item will work, otherwise it won't. I have a library system where you can view a page per monster that shows what it can upgrade to/drops/etc so you can always find that out easily. I want to add more depth to the monsters too, like happiness or something else that can effect it, I just have to figure out how to work it in with what I have. I'd do fusion, but that seems just like an extra step added on when you can already bribe or class change into any monster, so there's no need for fusion since you can obtain any monster via one of those ways. I am willing to adjust or change things though, it's not hard to change something I already have, just wanted a basic system down so it isn't flashy or anything, just functional. The shrine of course will be more than a single object, it'll be it's own room eith an npc and such. Right now it just needs to work. For the vid, it didn't record every time I opened the inventory and I have absolutely no idea why it does and sometimes doesn't. It's an OBS issue I guess. So that's why the chicken magically changed to a cockatrice, you just didn't see my open my inventory and use the green orb. 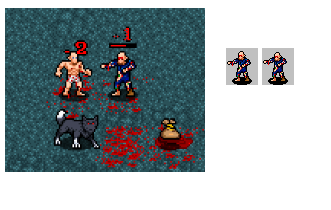 Hmm... How does the combat system work? I feel like I could make better suggestions about the monster variety if I understood it better. Are the five buttons on the bottom corresponding to something like attack, special, magic, food, (idek what the treasure chest would be), and skip turn? Drawing from the fusion idea, maybe there are variations on the same orb, that affect the properties of the class changed monster. Or maybe when you're class-changing, you can use secondary items to alter the class-change a little bit. Yeah, the first button is your regular attack. The second is your fervor or turbo attack. It builds up slowly from regular attacks. And then it can be used at it's lowest stage, middle stage, high stage, and full stage for bonus attack damage. Some monsters that are mostly melee will do more damage with fervor, too, or just gain more on hits so it builds up faster. So the more hits you line up and wait to use fervor, you'll do much bigger bonus damage. The 3rd one is your magic ability which will have always be one of the six elements. (Light will do more damage to dark, etc) The meat button is for items, and the treasure chest is bribe a monster (give it gold to try and recruit it, you can use items on certain monsters to increase the chance like a bone dropped from skeletons can be used in battle to increase your bribe chance by 5% per bone used but only on monsters that like bones. Like a giant rat's item will be cheese.) Everything is a placeholder because I'm not an artist, so the buttons are just what I have and what makes sense for right now lol. Also, I decided the non-battle part of the game is going to be a board game where you have a large board layout filled with traps, events, etc like in one you'd see on Mario Party and you move with dice rolls. You encounter monster pieces and have to fight them with the normal battle system. That way the game is two parts, one part board and one part combat. Here's an example of what it will look like as a board. I am having trouble getting it to look right, I'm trying to make it similar in the style of a Mario Party board. I can look into creating a "board map" so it looks pretty when players engage the game. I'm thinking of starting small with a graveyard and a secret in some old tree. Boss could be a Night Hag or Wraith King. Actually, I decided I wanted to focus more on the game's inspiration SO I scrapped the board game idea (after I finished coding it completely, go figure) and decided to make it more overhead action like Diablo. 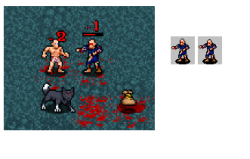 Which, fortunately, I just coded the most of last night, so the transition to a new battle system is complete. Sorry to keep being all over with the project, but hey, it's in that early stage where I can do that with it pretty easily. So don't worry about a board game map, I may end up making that a mini game within the game itself though. That way it doesn't go to waste. The turn based battle system is gone too, and now you have actual attacks you have to press the button for (or click) and you'll hit the enemy in front of you. Your monster fights beside you of course, attacking whatever your target is. You beat them and blood squirts out in little tiny pixel glory, and when they die, they become bloody pools, and you can leave bloody footprints when walking over them. Why? Because, why not. So now it's actually pretty funny to smack a slime to death, hear the smack sounds and watch it bleed and die. Smacking slimes to death is fun. You also have attack speeds that is based on whatever weapon you have, so if you have a fast one you can really just smack away at slimes over and over and watch them explode. I'm redoing the magic system to work with the new combat system too, but it will still be based on the six elements like I already have. This feels much more like it's roguelike and Diablo/Gauntlet roots. Thank you, and yes they did amazing work! It's why I'm so pumped to be working on the game, the main character looks great and I've got some good monsters to work with. There will be more, but this is the basic version of what I will be working with. 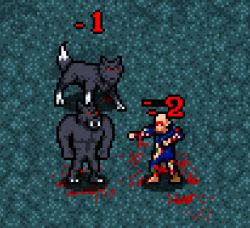 Is there any chance you happen to have a sprite laying around that could be a bloody explosion for the death effect? I am using denzi's explosion right now, but it doesn't really fit with all the red blood. Maybe a little pop or explosion that can be colored red. I think it would be cute. There is going to be a text box where you'll see what damage you do, like in a roguelike. Like "You hit Slime for 1 damage" unless I decide on something else. 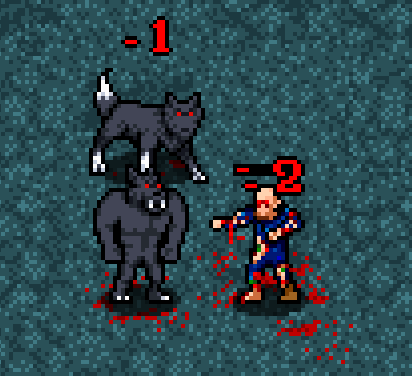 I'm still experimenting with what to add aside from the actual combat stuff, like ranged attacks, magic, etc. So you're looking for a Zelda/Hydlide/Secret of Mana style? Also, I just did this for fun if you'd like to use it. YES! I will put that in and then I will show you! That is beautiful, thank you. And yeah, it will be similar to those. Perhaps an overhead view for the hero would be a good change? Ha, those are good. I want to keep it simple and have them still sort of feel like they are "pieces" instead of actual fully animated characters like you'd see in zelda or something. Like how in Nethack they don't move, they are just static. I want that same feel but with a little bit of animation like you're moving character pieces instead of them walking. I made a zombie, do you think it can be improved? How do these work for you? Also an idea for laying traps as monster move about. I just want to say you're my MVP, thanks for all the awesome stuff. The zombies look great in action. Now to make more traps! Well it's fairly easy to create images based on your requested style. But are you absolutely sure you're keeping it like NetHack? Because I can dump a bunch of monsters, items, and tile sets fairly easy over the rest of the week for you. The only ONLY thing I'll ask for payment wise is if you want large scale boss monsters. I know Orcus and Asmodeus were bosses in NetHack, so if that's the case I'd have to k ow what specifically you'd want and if it's just 2 frames I'd say the going rate is 15.00 USD per boss set of 2. If you could make me some monsters or items based on some specialty stuff, I'd be willing to pay you for sure. There is one very unqiue monster I need made that is a major part of the game, but it's so unique I couldn't edit anything to be like it so I haven't touched anything to do with it yet. It's an ice cream sundae monster. It'd be 64x64 in size. I'll post a pic of what I have planned for it. If you can make it for me, I'd pay you for sure. If it doesn't seem like too much work of course. You don't have to shade it as well as you have either, since I am going with limited colors to give it a cartoony feel. Like my werewarg, it only has 2 shades per color. If you can take a look at this and if it seems like you'd want to do it, then let me know how much it would be. It doesn't need more than one or two frames, you can do only one if you want and I can make the 2nd frame. Yeah. I can do something like that. Do you want this monster in a cup or just an ice cream sludge creature? In the glass cup, sort of spilling out of it. It can have it's arms just sort of hanging beside it or whatever.